Start a Homeless Pet Business Club! Businesses can start a pet club too! Show your customers that you care about homeless animals (many of them do too!) One of them might just adopt a pet that you sponsor. By starting a Homeless Pet Business Club you can show your customers and the community that you are pet lovers too and want to make a difference in the lives of homeless animals. It's easy and it is FREE. We are not asking for your money, we're asking for your voice! Simply fill out the registration form below and you are on your way to helping homeless animals in your community. "The way people love animals in our town is a common denominator that has helped our business. It's amazing. When we put the pet we're sponsoring in our ads, we get new customers!" "We didn't join HPC to get more members in our civic club, but all of a sudden people are joining because they like that we are helping to save animals. There's a new energy!" 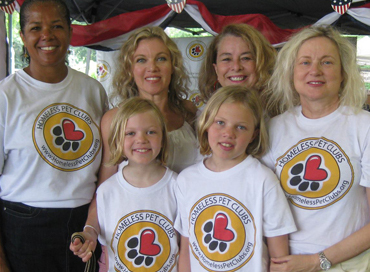 "Our business partners with a local school to help get the word out on our sponsored pets. It is great to work with these smart high school students who are teaching us a thing or two about marketing."